Laminate countertops are the most common counter you're likely to find. They are often used in the construction of homes since they are inexpensive but durable. Laminate countertops are made from layers of paper and plastic that are laminated together to form the countertop surface. But laminate countertops have come a long way and come in many color and design options. They can be made to fit any type of decor or theme. And laminate countertops are not difficult to take care of. What Are the Pros of Choosing Laminate Countertops? Laminate countertops hold up well to all the things a family can throw at them. These countertops will resist a lot of scratching and spills and are even fairly stain-resistant. They don't burn easily or dull on their finish without something severely damaging them. Many different patterns, colors, and finishes are available to choose from which makes homeowners have a lot of choices to fit their style. These countertops are super simple to clean and very forgiving of a lot of mistakes by their owners. What Are the Cons of Choosing Laminate Countertops? Although laminate countertops stand up to a lot of spills and scratches, they can be damaged. And when they finally are, it's nearly impossible to repair. Not only that, but the damage tends to spread. That layer on top of the countertop protects some really vulnerable layers underneath. Once the surface is damaged and the area ​underexposed, the countertops will start to deteriorate rapidly. Laminate countertops have seams or places where the pieces meet. The seams are visible but glued together. The seams are extremely susceptible to water damage. If you notice swelling or odd shapes in parts of the seams, you may need to look at the cost of repair. Unless you take care of it quickly, the damage will spread. 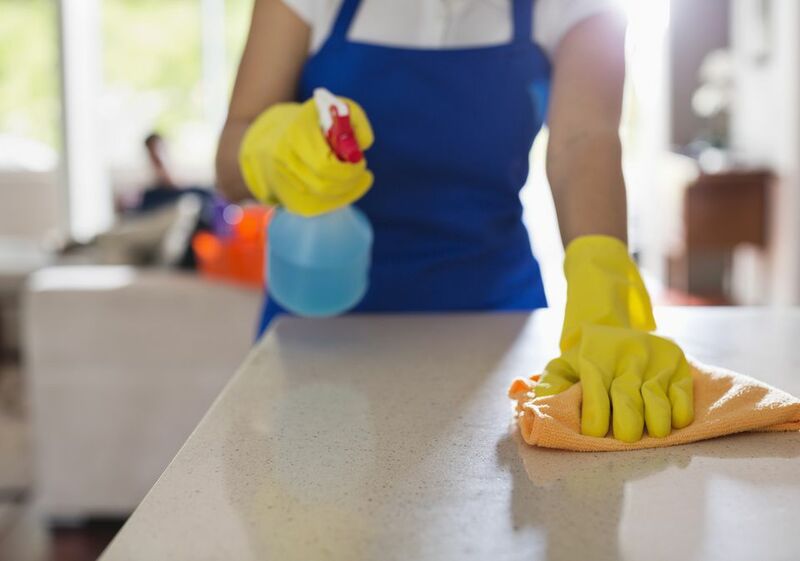 Like many types of countertops, cleaning laminate is actually a simple process. For daily cleaning use a clean cloth, a mild dish soap, and water. Dry the countertop after washing to prevent water from pooling in the seams. That's really all that is necessary to clean the surfaces most often. Stained areas can be treated with a baking soda paste. Mix a 3:1 ratio of baking soda and water. Spread over the stain. Let sit for 3-5 minutes before wiping away. Don't scrub the countertop because, although it's a mild abrasive, the baking soda can damage the finish of the countertop. Although this depends on the finish of your laminate and the color. If you have white laminate, baking soda is unlikely to damage the finish with a light scrubbing. You can use a special paste available for purchase from your countertop company or from a home improvement store for laminate countertops to repair small scratches or chips. Several colors of paste are available in hardware stores so it is simple to match the color and repair the scratch or chip. It's important to do this quickly since chips or scratches in the top layer can get worse when you ignore them. No regular maintenance is usually required.